Gimmickry in craft beer, and especially beers brewed with product tie-ins or cross promotion, are typically a very tough sell for me. To say it more simply, I hate gimmicks, and there are typically few things more gimmicky than a brewery partnering with some snack food giant to make “Twix stout” or “Twizzler lambic” or some other form of promotional BS. And so, when Paste received a few bottles of Flying Dog’s seasonal summer ale made with Old Bay seasoning, I won’t pretend that I was terribly optimistic about the prospect. On the other hand, few beers of this nature come in with quite as much buzz behind them. When Flying Dog first made Dead Rise last year, it became an immediate seasonal sensation, selling out everywhere it was sold and forcing the brewery to produce more than anticipated. This of course raises the question of whether drinkers were purchasing sixers of Dead Rise because they really enjoyed it … or because it was an amusing novelty to be able to gift their friends a beer made with Old Bay. But either way, they had my attention by this point. 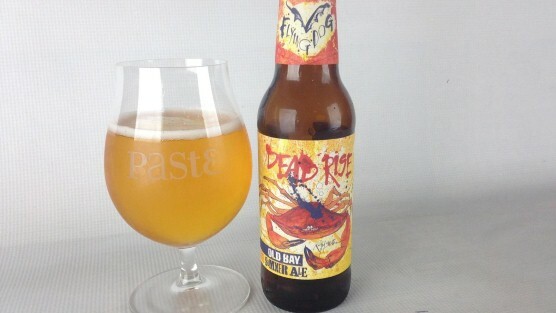 Regardless, what I actually found in Dead Rise was a surprisingly drinkable, well-conceived beer, considering that it was presumably inspired directly by an ingredient typically found powdered on soft shell crab rather than dumped into a fermenter. It manages to feature the namesake spice blend in a tasteful way, rather than simply going overboard in its zeal to preach to Old Bay disciples. The spices come through most heavily on the nose, but not quite as anticipated. Rather than a shaker full of Cajun seasoning, there are a lot of aromatics reminiscent of classic Belgian ale phenols—clove, pepper, etc. There is, however, a certain “brininess” that sort of makes one think of salt water, as well as a certain unmistakable note of paprika and herbal bay leaf—taken together, it smells like you could certainly boil crabs in it—or perhaps like someone already has been. On the palate, however, the flavors are more subtle. Finally we’re reminded that yes indeed, this is beer, one that features a mild, pleasant maltiness and slightly creamy texture. The spices come out with clove, and that chile pepper/paprika note pops up again, making it a bit unlike other spice beers I’ve tasted before. Still, the overall experience isn’t that far off the beaten path, to the point that I doubt whether I would have identified the beer as featuring a spice blend such as Old Bay if it were tasted completely blind. Rather, I think I might guess at Dead Rise being some sort of Belgian strong golden ale, except less boozy. What this suggests—an accurate suggestion—is that the spices in Dead Rise really are pretty well incorporated; enough to make it a beer that can stand on its own merit, more than simply a gimmick made to feature a single ingredient. I doubt I’d be rushing out to clean out the liquor store if I was in Maryland, but then again, I didn’t grow up sprinkling Old Bay on everything I ate. Jim Vorel is Paste’s news editor. He has a tin of Old Bay in his spice cabinet that has probably been used twice in as many years. You can follow him on Twitter.